Throughout the last few years, Anna Von Reitz, has been explaining the history of the continuing criminal enterprise called the Crown Temple B.A.R. and how they’ve been pirating our lives and land. These are truly sick people, and they should be prosecuted for their crimes of treason and murder and enticement to slavery. The Crown/Vatican/Swiss Banksters and their Zionist-Jesuit murderers really and truly should be rounded up and thrown in a remote, lonely place to be kept alive, in captivity, for the rest of their days. Evidently, either everyone forgot history, or they can’t see it unfolding before their eyes, or both. “I’ll say this plainly, I’ve said it before – Taxation is theft. It presumes the government has a higher claim on our property than we do,” says Judge Andrew Napolitano, the host of Fox Business’ Freedom Watch and the author of the new book, It Is Dangerous to Be Right When the Government Is Wrong: The Case for Personal Freedom. Winston Shrout was indicted in federal DISTRICT OF OREGON Court. I hope everybody realizes that DISTRICT OF OREGON is a district of District of Columbia, since the term “United States” means District of Columbia. And that obviously is a FEDERAL REGION, since federal courts DO NOT have jurisdiction over states of the Union, UNLESS they specify that it is a matter involving INTERSTATE COMMERCE. He’s scheduled to be on Tad’s talkshoe today, March 29th at 6PM Pacific. See a link at the bottom. He’s accused of making and issuing more than 300 fake “International Bills of Exchange” on his own behalf and for credit to third parties. The government contends Shrout falsely claimed the bills had value and purported them to be worth more than $100 trillion. IN NEARLY 60 YEARS of alleged space exploration NASA has never been able to offer us a single genuine photograph of the Earth from space—NOT ONE! Even though we’ve had good, high-resolution cameras for nearly 100 years, NASA has never taken a true photograph of the Earth. By their own admission, all of the pictures we see are composites, paintings or computer-generated images. Why is this? Could the answer be, horror of horrors, that NASA has never been into space—or at least, not far enough from the Earth to get the whole planet in the frame? Aren’t space shuttles supposed to go up and stay up? These seem to immediately come down again! Companies owned by foreigners face closure unless they sell or give up 51 percent of their shares to black Zimbabweans by April 1, announced Indigenization Minister Patrick Zhuwao. “Comply by that date or close shop, comply by that date or face the full wrath of the law,” Bloomberg quotes Zhuwao, who is also President Robert Mugabe’s nephew. This month, the IMF asked the Mugabe administration to clarify the country’s policy on black empowerment. Zimbabwe has agreed to major reforms including compensation for evicted white farmers. Harare says it expects an IMF loan in the third quarter of this year, the first since 1999, after repaying foreign lenders $1.8 billion by the end of June. As announced in the New York Times, the same people who put a statue of the “Mother of All Whores” —- Ashtoreth—- in the middle of New York Harbor and passed it off as “The Statue of Liberty”—–have been hard at work to invoke their ancient Babylonian “god”, Marduk. They want the Lord of Libertines and Criminals to visit London and New York, and they are convinced that if they rebuild the Arches of the Temple of Marduk, he will come: Lucifer, himself, in the flesh. They want to worship him. Picture a great big, glowing red Bull’s Eye painted on New York and London, because that is what these deluded monsters are doing and which the rest of you are ignorantly allowing. How ingenious of the Great Gardener. Award winning filmmaker Bart Sibrel (Sibrel.com) presents his highly acclaimed (and much hated) controversial documentary showcasing newly discovered behind-the-scenes out-takes from the first mission to the moon, proving that the crew never left earth orbit. 19 And the great Citie was diuided into three parts, and the Cities of the nations fell: and great Babylon came in remembrance before God, to giue vnto her the cup of the wine of the fiercenesse of his wrath. 8 The beast that thou sawest, was, and is not, … and they that dwell on the earth shall wonder, …when they behold the beast that was, and is not, and yet is. When headdresses make the news, the story usually revolves around non-indigenous people wearing them — and whether that’s appropriate. Some music festivals have banned headdresses, and last year the Winnipeg Jets hockey club decided to bar fans from wearing headdresses at home games after a Chicago Blackhawks fan showed up sporting one. 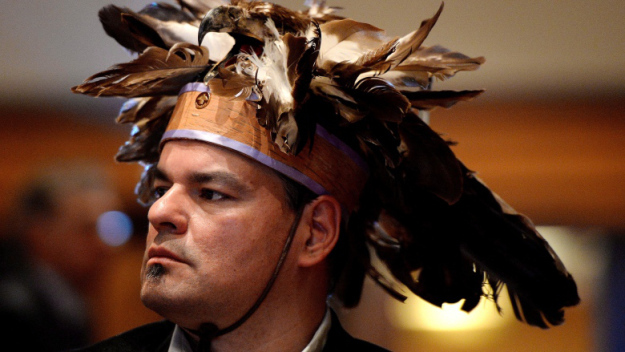 So what is the significance of the headdress and who should be allowed to wear one? CBC Aboriginal reached out to First Nations leaders in Canada to find out how they received their headdresses and what it means to wear one. The Bundesbank has announced plans to repatriate some of Germany’s gold reserves from abroad. At least half of the country’s gold would be transferred to Frankfurt by 2020, according to Bundesbank President Jens Weidmann. Weidmann says 366 tons of gold worth €11.5 billion have been delivered to Frankfurt so far. “There are now about 1,400 tons or 41.5 percent of our gold reserves here,” the banker said. In October last year Germany’s gold reserves stood to around 3,384 tonnes, worth about €120 billion, which is the second largest in the world after the US. Weidmann added the rest of the gold will remain in New York and London, which he says are as safe as Germany. In case of emergency, these reserves would quickly be converted on the markets in these cities, the banker said.